Aramark currently trades at a steep discount to its peers (P/E 12.5x, EV/EBITDA 8.5x), specifically Sodexo SA (P/E 19.6x, EV/EBITDA 11.0x). This steep discount is unjustified given Aramark’s stronger positioning, growth potential, and higher margins compared to Sodexo. The firm is set to benefit from continuing tailwinds from both the U.S. consumer and corporations, while insulating itself from market downturns due to diversification of revenues. Large acquisitions of Avendra and AmeriPride made in early 2018 will be fully realizing synergies by FY2020. Management falling out of favor with analysts (despite consensus 30% upside) presents a unique value-play with potential of significant multiple expansion. Aramark’s business is primarily in cafeterias and concessions as well as general services to support and maintain facilities including custodial, plant maintenance, and grounds-keeping. They provide services to a multitude of clients including universities, K-12 school districts, hospitals and healthcare facilities, sports stadiums, museums, state parks, and corporate facilities. The business has 3 major operating segments: Food and Support Services (FSS) US which supplies two-thirds of revenues, FSS International which supplies a quarter of sales, and the Uniform and Career Apparel segment which represents fifteen percent of sales. Aramark stands to benefit from multiple industry trends along with a strong general macro environment. Given the wide range of services that Aramark provides, its operations are set to benefit from strong consumer sentiment and purchasing power prevalent in the coming years resulting from a tight job market and rising wages. The global food/facilities services total addressable market is estimated to be ~$900bln, with continued shifts toward outsourcing as clients become more sophisticated in their cost management (IBISWorld - Industry Market Research, Reports, and Statistics). The Sports, Leisure and Corrections segment, which makes up 25% of total revenue for the firm as shown below, is specifically positioned to benefit from these trends. Additionally, Aramark is well positioned in the Education and Healthcare segments which are currently trending towards outsourcing services, particularly food services that are focused on bringing healthier, more nutritious options to their facilities. Aramark operates in a highly competitive industry with its two major competitors being Compass Group PLC (CPG:LN) and Sodexo SA (SW.PA). The industry’s competitive environment stems from the fact that companies compete primarily through bids to provide services to clients and typically these long-term contracts are renewed periodically. Aramark in particular engages in two forms of contracts – profit and loss contracts (where Aramark bears all financial risk) and client interest contracts (where clients will reimburse operating costs and pay management fees). Profit and loss contracts make up two-thirds of FSS sales while client interest contracts make up one-third of sales. Despite aggressive competition, Aramark holds the #2 position in North America for both food/facilities services and uniform services based on sales. Additionally, they hold the #3 position among competition with respect to their international operations. 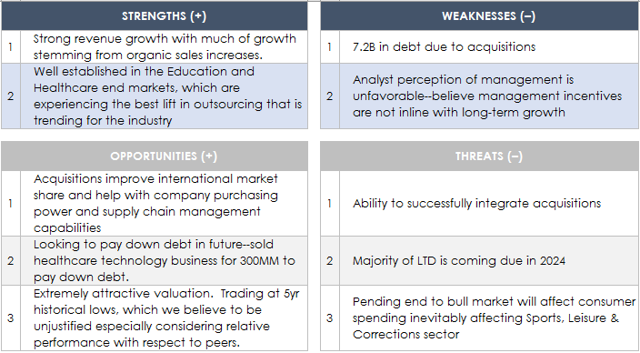 Before introducing the investment theses, reference the SWOT analysis of Aramark for a broad-picture of where the firm stands today. When analyzing comparable data, there is plenty of value to be realized within Aramark. 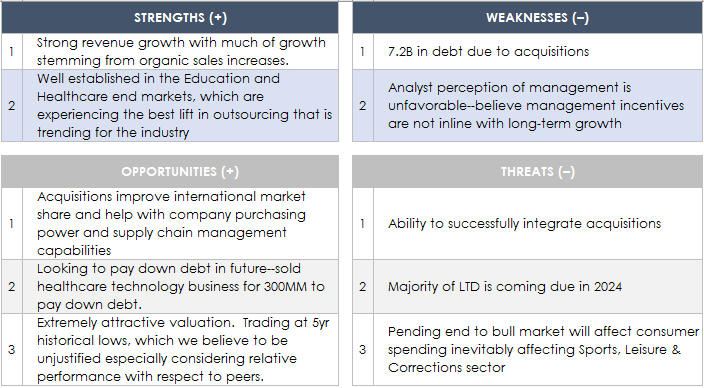 Despite lagging best-in-class Compass Group, there is a strong case to be made that it is unjust for ARMK to trade below its median peer; Sodexo. Sodexo is currently trading at a P/E of 19.6x and an EV/EBITDA of 11.0x. These valuations are much richer than Aramark, which boasts a P/E of just 12.5x (a 56% discount) and an EV/EBITDA of 8.5x (a 29% discount). Interestingly, top-line revenue projections and margin analysis indicate that Aramark’s general valuation metrics are mispriced. Aramark has posted annual sales increases of 4% (2018 number of 8.1% growth is inorganic to due to acquisitions) and has made 2019 projections for 2-4% growth. This projection is much higher than Sodexo’s expectation of just 0.6% YoY, especially given Sodexo saw 2% shrinkage in their top-line in FY2018. Higher revenue growth projections and a higher 5-yr CAGR indicate that Aramark should not trade at such steep discounts to peers. When analyzing margins, it is apparent yet again that Aramark is outperforming Sodexo. Aramark posts better EBITDA, Operating, and Profit margins across the board. Evidence of the effects of macroeconomic trends on Aramark is visible when looking at the correlation between the company’s revenue, wage growth, and corporate profits. The graphs below demonstrate how, from 2014 to 2018, revenue grew in a manner in-line with wage growth and corporate profits. Given that wages are expected to continue growing at around 2.5% YoY and corporate profits at 2.4% YoY by 2020, the positive effect that these trends have had on Aramark’s revenue is likely to continue for some additional time. Aramark has substantial downside protection, due in part to its well-diversified portfolio. Aramark holds a substantial percentage of contracts with education (23%), healthcare (13%) and sporting and correctional facilities (17%), all of which are less sensitive to economic cycles. The remaining portion of its portfolio deals in business and industry (34%) and uniform services (13%) which, according to guidance, are more susceptible to cyclicality. From a macro perspective, Aramark’s client base spans 20 countries worldwide, offering protection against state-specific crises. Operations are concentrated in the U.S. (77%), with the remainder of operations distributed throughout Canada, Chile, China, Germany, Ireland, and the U.K., and several additional developed and emerging markets. Low correlation among its global holdings allows Aramark to hedge against disruptive, nation-specific events, helping the company to achieve stable cash-flows. No single client accounts for more than 2% of total revenue, further diversifying revenue streams. Additionally, approximately 14% of sales come from U.S. federal, state and local governments and agencies. Though this revenue is subject to changes in government regulations, the upside of a guaranteed revenue stream far outweighs the potential risks. Aramark’s current holdings are subject to seasonality, primarily seen in the sporting facilities segment during Q1 and Q4. 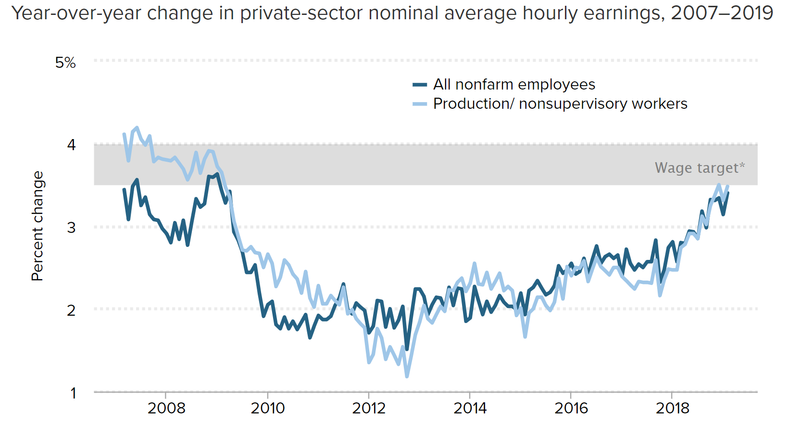 This is offset by increased revenue from education contracts during the same time period, effectively reducing the risk of a significant, unexpected decrease in earnings. Downside protection also stems from Aramark’s high customer retention rate (94%) and its propensity to secure long-term contracts. The average contract length is roughly 10 years, ensuring predictable cash flows over the long term. Evidence of Aramark’s ability to weather negative market conditions can be seen in its performance during the 2007 financial crisis. The company was able to maintain profitability during this period, registering a stable 8.2% EBITDA margin. Aramark has achieved consistent revenue growth over the past seven years (since IPO), with little likelihood of a reduction due to market cycles. In terms of company risks, Aramark is considered a highly levered company, which investors will quickly notice when researching the company. In 2017, Aramark acquired two companies with the goals of strengthening its industry position and expanding its geographic footprint in Canada (Burdo). The companies included Avendra, “a hospitality procurement service provider in North America”, and AmeriPride Services, “a uniform and linen rental and supply company”. These acquisitions totaled $2.35B, and were financed entirely by debt. As of September 28th, 2018, Aramark reported outstanding debt of $7.24B. If Aramark were to see a substantial pullback in revenues, most investors would have concerns about the ability to pay debts on time or needing to take out more debt to fund operations. As noted in the 10-K, this would also expose the company to interest rate risk. 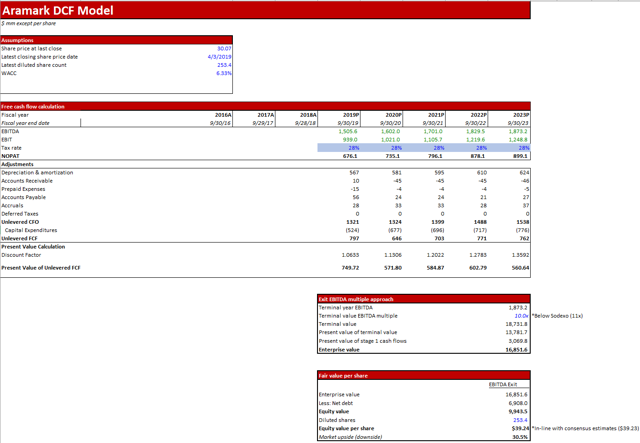 That said, Aramark mitigates this risk by financing with fixed-rate debt. Specifically, 90% of their debt is fixed, and a 100bps increase in LIBOR would only result in a $2m annual increase in interest expense. Therefore, the majority of their debt is protected against rises in interest rates and therefore increases in payments. Additionally, since being brought public in 2013 by a group of private equity investors who loaded the firm up with $6.2b in debt, the company has managed the substantial debt-load, even through market downturns. As a result, we do not believe the current leverage is a major cause for concern, and management has said multiple times they are actively working to pay down the debt load. 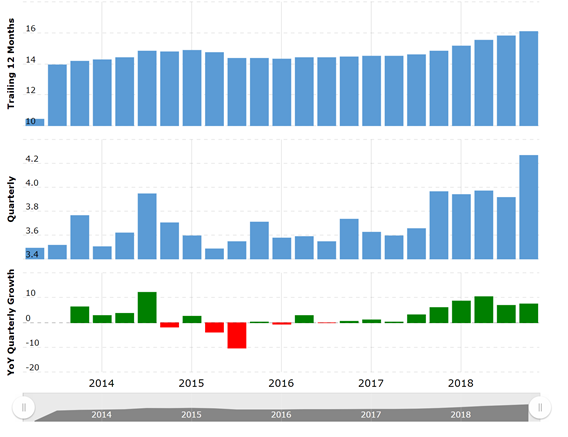 To stay conservative, LTD was held constant after accounting for a paydown of $200m of LTD in Q1 2019, despite management guiding for a decrease to 3.8x Debt/EBITDA by year end and a 3.1x by 2021. The other major assumption was assigning a terminal value EV/EBITDA multiple to just 10x, still below Sodexo’s of 11.5x. We believe this to be extremely conservative, as the current 8.5x valuation is the cheapest Aramark has traded at since its IPO. In addition to the thesis points made above, it is important to note that the recent sentiment on Wall Street regarding ARMK has been very negative. Two Nomura analysts openly called for an activist investor to come in and change up management, as “they are definitely not leveraging the full power of the business” ('Enough is enough': Wall Street analysts want Aramark top execs pushed out as growth lags). Brubaker goes on to mention a possible misalignment in long-term incentives for management, citing that Compass has a better compensation structure. However, Compass’ long-term compensation consists of only 20% of shareholder returns, while Aramark stands at 50%. Whether or not an investor prefers shareholder returns over financial metrics for compensation, there are two likely scenarios going forward: 1) CEO Foss and team improve their performance and regain favor on Wall Street, giving the stock some momentum or 2) The installation of new management generates momentum for the stock. In either case, there is likely to be a rebound in performance from here. All this considered, Aramark should outperform throughout 2019 and beyond, especially when considering that the integrations of both Avendra and AmeriPride should be completed by the end of this year. We ultimately arrived at a 30.5% upside for the company with our very conservative assumptions throughout the model, with a target price of $39.24, almost precisely the consensus target price of $39.23 (Bloomberg). 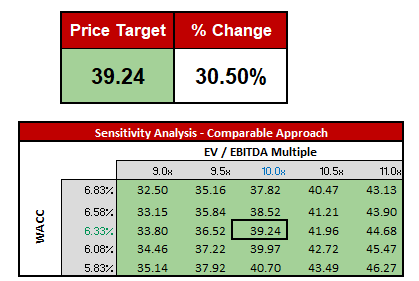 Should Aramark outperform Sodexo going forward (as we expect) and see multiple expansion to 11.0x that Sodexo currently sits at, there is significantly more upside with a target price of >$44.68.